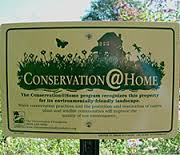 Beth Adler and April Anderson from the Barrington Area Conservation Trust (BACT) will give a presentation 05/23/2015 at 10:00 am Christ the Lord Lutheran Church, at 12N462 Tina Trail in Elgin about the Conservation@Home Program. Conservation @ Home educates, supports and recognizes homeowners who incorporate eco-friendly (or best management) practices into their yard. The foundation of the program is native plants, storm water stewardship, and eco-friendly lawn care. The presentation explains why making these changes in our yards is very important for biodiversity and the hydrological cycle. There will also be a case study featuring one of BACT’s Conservation@Work certified businesses highlighting the effectiveness of rain gardens, shoreline buffers and the cost to install turf grass vs. native landscaping. The presentation explains why making these changes in our yards is very important for biodiversity and the hydrological cycle. After the presentation we will walk through Rich Wilson’s gardens, a Conservation@Home?certified yard, in Huntley. We will be starting the garden walk at approximately?11:15. Rich?s garden is at 41W110 Powers Road, 1 1/2 miles due east of Route 47.? Rich has been restoring his 6 acres in a wildlife positive manner for the last 30 years.? At this time, 2 acres are in prairie, which was established 30 years ago. A trail leads around the property where there are young oaks as well as mature trees serving as windbreaks.? In addition, there are rain ponds, rock gardens, a milkweed bed, flower gardens and a vegetable garden, as well as a very degraded peat bog leftover from a lake? that was there in the late 1800?s.? Rich considers this a Wild Ones work in progress and invites you to come and enjoy, feeling free to pull all the garlic mustard you would like. ?Please join us! While at Rich Wilson’s home, Wild Ones members are invited to participate in a native plant exchange. Bring in native plants that you have to exchange for native plants you may not have. If you are not a Wild Ones member, you can still participate in the plant exchange for a donation to Wild Ones. Our program begins at?Christ Our Lord Lutheran Church, Elgin IL. More information.